PDFtoMusic can help you download score files in PDF format from the Internet, and help you to hear them. 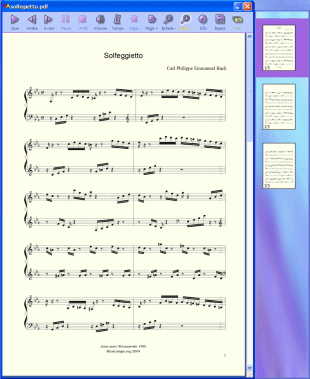 PDFtoMusic can also hear the Soprano part from the score your choir master owns on his computer. PDFtoMusic is designed for you. Open a PDF document, and after a few seconds, you just have to click a button to hear the score playing, and even the lyrics be sung! PDFtoMusic gives you full access at last to the huge PDF music score collection. PDFtoMusic gives you full access at last to the giant PDF music score collection available on the Internet. Because PDF files can be generated from virtually any music software, even discontinued ones, PDFtoMusic, through the MIDI or Myr export capability, can also act as a universal score file converter. From a PDF file, PDFtoMusic Pro extracts in a few seconds the music-related elements, and enables to play the score, or to export it in miscellaneous formats, like MIDI, Myr (Harmony Assistant files), or in a digital audio format like WAV ou AIFF. Qweas is providing links to PDFtoMusic 1.2.0 as a courtesy, and makes no representations regarding PDFtoMusic or any other applications or any information related thereto. Any questions, complaints or claims regarding this application PDFtoMusic 1.2.0 must be directed to the appropriate software vendor. You may click the publisher link of PDFtoMusic on the top of this page to get more details about the vendor.